As Oncidium Orchids originally come from a range of climates from sea level in the tropics to the high mountains of South America. They are an epiphytic orchid and best results seem to come when they are mounted on bark mounts, mimicking the natural growth habit. This method of cultivation seems to eliminate the problem of root rot which is common with pot grown specimens. 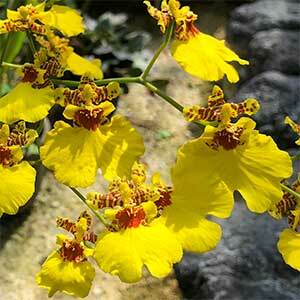 The Oncidium Alliance are a hardy group of orchids and cope well with a wide temperature range. Along with this they are hybridized and have large racemes of flowers which makes them popular not only with collectors but also with florists. Generally speaking they are an easy care and hardy variety and will survive in less than ideal conditions. Bright filtered light is essential, you can usually tell by the leaf color, a nice bright green rather than deep green is what we are after. The darker green usually indicates to little light. Try a position in a shade house where they receive good strong filtered light and good air flow. Most varieties are best grown in hanging baskets or slatted orchid baskets. Good drainage is essential so a course pine bark will work well. During the winter months they need little watering and more light, in the warmer months, a 50% shade cloth is suitable as is more regular watering. These are an orchid that like to go almost dry between watering, especially during winter dormancy. Increase watering and humidity as temperatures rise. One trick is to pinch out flowers of young plants, this seems to speed up development of new plants. The root system of a healthy plant will work its way through the potting medium, at a glance if the roots are green, then the plant is in active growth and its time to water and fertilise them. Watch out for snails and slugs eating the roots, this can set the plant back dramatically. The best time to repot Oncidiums is in early spring as the move into the active growth cycle. Most varieties will flower in autumn. 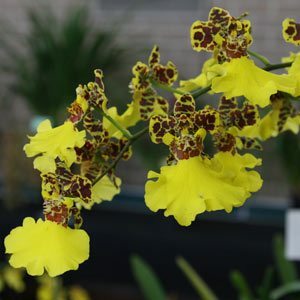 Species include Oncidium sphacelatum and Oncidium incurvum however with over 200 species and a huge number of cultivars or hybrids the variety is huge. Many hybrids are available including varieties such as Bratonia estrelita, pictured. others go under names such as Beallara, Burrageara, and Colmanara. To little light in winter. To much light in summer. 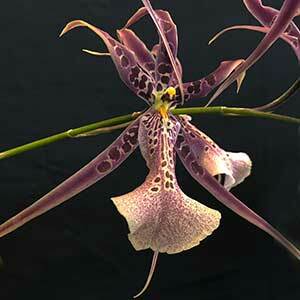 Oncidium Orchids are available for sale online from the following growers.